Made this tonight! Only added ingredient was some red pepper. This was delicious and so simple. Can`t wait to eat the leftovers! I made it as is and it was delicious but when I had it for leftovers I added just a bit of basil and crushed red pepper and that just took it to a whole other level! This is going to be my new pasta dish for when company comes over. Amazing. Had to tweek with ground turkey and added my own Ilalian seasonings. Delicious, everyone should try this. New favorite. I made this tonight for the first time after having it bookmarked for a while. It’s soooo good! I did have trouble getting eight servings from the recipe, though. I measured out 1.5 cups for meals, and got about 5.5 servings. I used all the measurements the recipe called for, so I’m stumped. This was delicious! I’ve never cooked with chicken sausage before but this recipe was amazingly easy, flavorful and dare I say even better the next day? Thank you Gina for taking the guesswork out of dinner! Made this with pork sausage and it was AMAZING. Added some red pepper flakes because, why not? Will make again! This recipe is absolutely delicious! 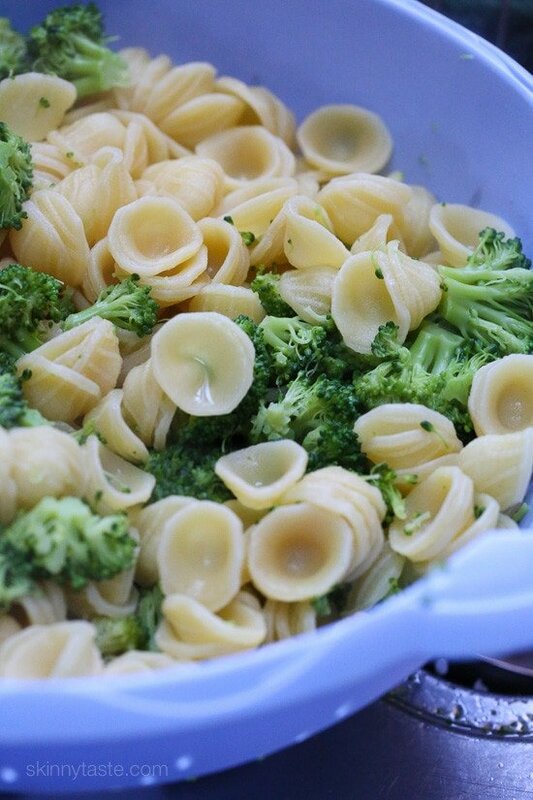 I love the flavors of the broccoli, cheese, and olive oil. I use the 14 oz. chicken Italian sausage from Whole Foods. What a great idea to incorporate some lemon flavors in there, too. I am confused about the serving size. If I measure out 1 1/2 cups, there are only about 5 or so servings. When I put it into the Weight Watchers recipe builder and used my food scale to weigh the total and a portion, it comes out to be 11 points. Any thoughts as to why this would be so off? This is starting to become a regular staple in our house and I don’t want to be too off on the points. Never fails.. Soo good. Tastes just like spaghetti garlic and oil, which I have been craving.. Loved it.. Have to half the recipe for 1 next time.. Have to give most of it away or I will inhale it all. Says this Italian! Soooo good. 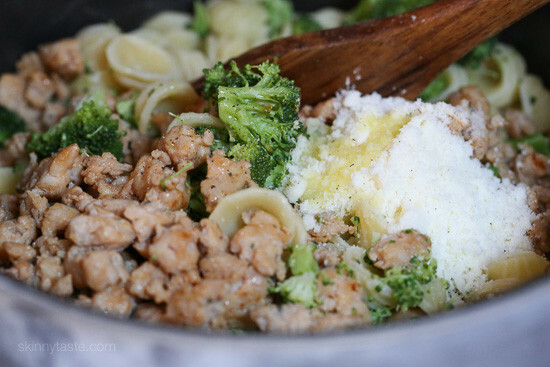 We do not have broccoli lovers at this house and it was still a hit! YUM!! Like everything I try from Skinnytaste, this was amazing! Thanks for all the inspiration! This is amazingly good. you won’t regret making it. Love this recipe! Any way to make it in the instant pot?? ?Love you, Gina!! Yes I would love to see an instant pot option! I know it’s an easy recipe but I was more thinking less dishes with the instant pot! I’m serving this for ladies next week. What would be colorful and good flavor side dish to serve with it?? Love this recipe, it’s a regular in our monthly rotation. Comes together quickly for weeknight cooking. This was sooooo good and comes together in a pinch!! Your recipes are amazing! This one is wonderful. I’ve made with shells when I can’t find the orecchiette. I’ve also substituted sweet Italian sausage when I didn’t have chicken sausage. either way- it’s great and husband-approved. This is the one dish my non veggie eater will eat. I can also make it non-dairy for my daughter. Makes excellent leftovers for lunch the next day. Definitely a winner in our house! We’re lucky that one of our favorite vendors at our local Farmers Market sells packages of chicken sausage (no casing! ), making this even easier. Last night we sauteed an onion, some chopped red bell pepper, and carrots before browning the sausage to add even more veggies; it turned out delicious! Yum! Sounds good! That’s awesome about your local market! Love your recipes…but I was wondering if points have been adjusted to account for the newly added zero points foods. Or do you suggest we just plug into WW recipe creator? Made this tonight and it was quite good! Followed the recipe exactly with the exception of using turkey sausage instead of chicken, and it worked out perfectly! 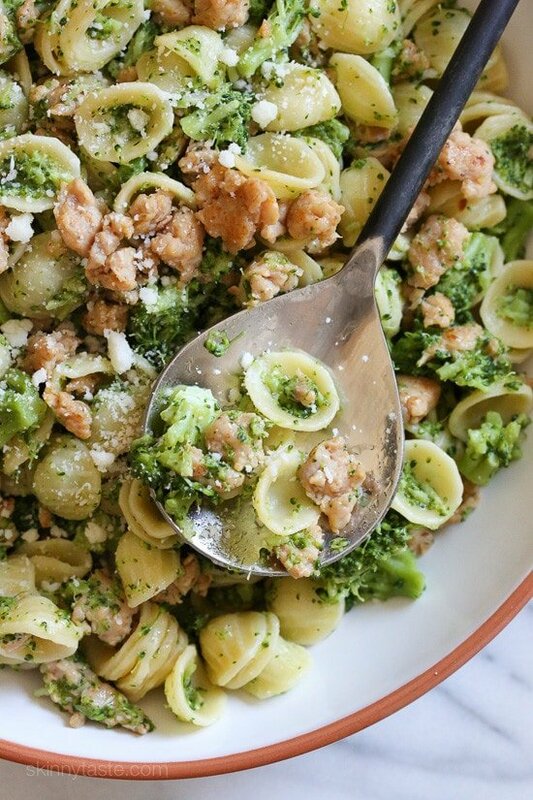 I love how the broccoli totally breaks-down and coats the pasta as if it were a pesto – such a great idea! Hubby approved, and it was a nice healthy change to our usual creamy sauce-laden pasta dishes. Thanks!! I fixed this fantastic recipe last night. By mistake, I had purchased Boars’s Head already cooked robust chicken sausage which I had to slice rather than breaking up. This recipe is easy preparation and excellent. I am looking forward to purchasing the correct sausage and trying again..
What brand of Italian chicken sausage do you use? Thanks!! Cheated with a spoonful of Costco pesto at the end, and threw a handful of sundried tomatoes (not marinated) in with the boiling pasta and added the broccoli half way through the the cooking time. That special cheese was worth the splurge too. Awesome! Pingback: Pre-Week – Turnip the Bacon! FOR EVERYONE READING THIS; I have made this recipe at least 8+ times and each time it has been wonderful! Definitely a recipe to keep on hand – Sooooo delicious! Does it matter if you use hot Italian chicken sausage? Thanks! You can if you wish! This is absolutely delicious! 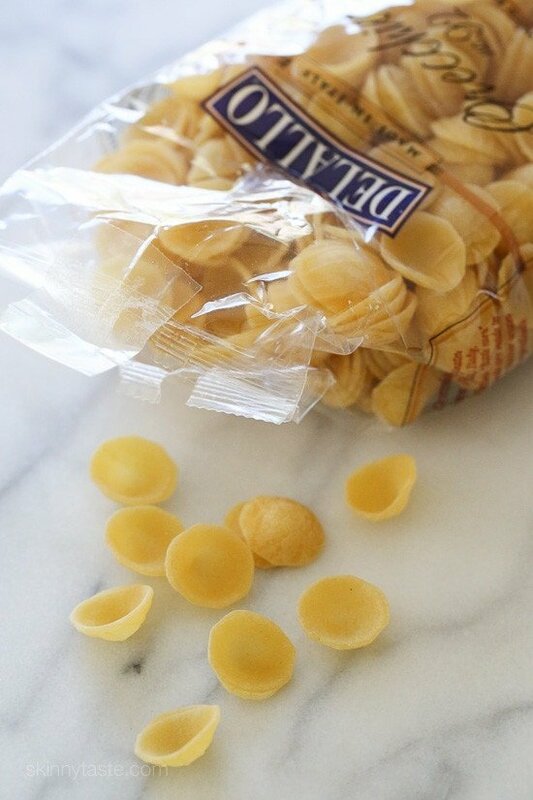 There is just something about orecchiette that I love! I added mushrooms to mine….favorite in my house too! This recipe has become an old friend. On the night when we moved into our new apartment and needed something hot, easy and filling. After long, sweaty days of hiking when we could barely wait to eat. The day that I didn’t get into my top choice graduate school. The time I had the flu but still needed to feed my boyfriend’s mother. I’ve made it over and over again, until I memorized the steps. Until the act of making it has become almost as therapeutic as the first delicious smells of sausage and garlic cooking. It comes together quickly and easily, leaves minimal mess, and tastes stupendous. Like everyone else said, it’s a fantastic way to get even the pickiest eater to down broccoli–and go back for seconds. I’m not usually sentimental about food and cooking, but this recipe can get me going. So healthy, versatile, and great. I made this tonight and we love it!!! I’m curious if it could be adapted to instant pot? I got my first instant pot today and I’m looking forward to trying your one pot spaghetti recipe tomorrow. It’s witchcraft! This is the first time in more than four years I have been able to feed my very picky kid broccoli. Thank you! I always check the comments on recipes before making them so I figured I should leave one! I made this last night and it was DELICIOUS! My boyfriend also really enjoyed this recipe! 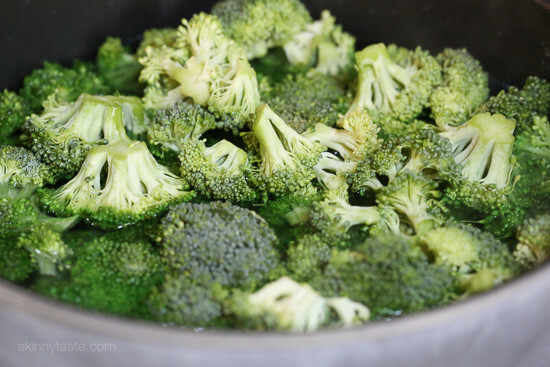 If you are a steamed/cooked broccoli fan like myself, I suggest using more broccoli. I used over a pound and still wanted more! Thanks for sharing!! Thisbwas delicious! So fast and easy! I’m all about 1 pot dishes eith 4 kiddos under the age of 5!!! And the kids even loved it!! This one is a keeper! 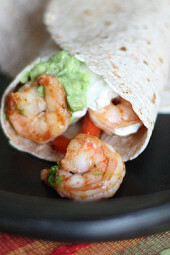 Quick, easy, and makes enough for left overs! The only thing I would do differently next time is to let the pasta cook a few minutes before putting the broccoli in. By the time the pasta was done, my broccoli had turned to mush! Still tasted GREAT though! Hi Gina, I made this tonight and it was a big hit! So delicious! Any idea how much saturated fat is in the recipe per serving? I normally made this dish without meat, Mum called it ‘pasta brocolli’. Will give it away with chicken sausage, certainly sounds good! Can I use frozen broccoli florets? This looks delicious. Are there any suggestions for what I can use instead of sausage? I don’t like sausage of any kind (even turkey or chicken sausage) thanks!! We make this frequently, ty for the share! Just made this and was DELICIOUS! The whole family approved. Will make this over and over again. It was simple and fast! Do you have a suggestion for a broccoli substitution? I have 2 in my family that cannot eat it and we haven’t tried broccoli rabe because we are not sure if they will have the same reaction. Thanks! You can try spinach, or kale. I know people have asked, but I too have a lot of frozen broccoli andwas wondering if I could sub for fresh. Would I let it thaw first or add from frozen? Thanks Gina, you always reply and have the best recipes! I would add it frozen. Made this for the first time today and it quickly made it to the Keeper List! From the aromas as I made it, to the first tastes from the pot, it became a favorite. The fact that my Ew-It’s-Broccoli 6 year old wanted seconds–well, Gina, my hat, once again, comes off to you. Thanks for sharing! You’re welcome Michelle! Love it when it’s kid approved! Any recommendations for chicken sausage brands? I don’t often see it at my very limited market and what i do see is more of a kielbasa style. So good!!!!! I used medium shell pasta instead & it was amazing-I love how the broccoli rested a “pesto” type sauce by cooking it with the pasta!! Thanks Gina!! Could you use frozen broccoli? Yum! This was great! Simple, healthy and delicious! My kids and husband ate it up! Thank you!! This was fantastic! So easy and fast to prepare, and lots of leftovers for tomorrow. I cannot wait to try this. Thanks for the recipe! Made it tonight with Roma Chicken sausage from the meat counter at Central Market. It was delicious! I have to try this recipe for today toddler! Can you recommend any other veggies this might go well in this dish? I think maybe sautéed mushrooms would be great with the pasta, sausage, and broccoli! Any other ideas? onion sauteed with the sausage would be good. When would you suggest to add the tomatoes? Maybe sauté them with the garlic? What brand of Italian Chicken Sausage do you use? 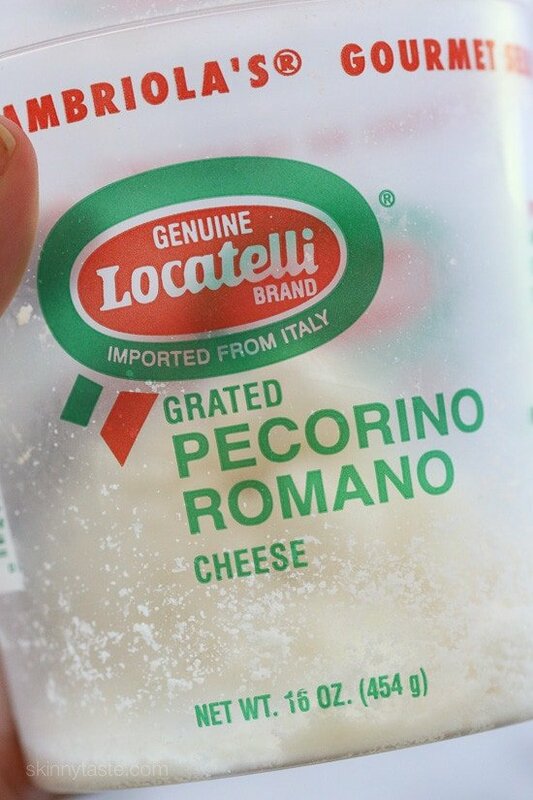 This dish sounds amazing but I do not like pecorino romano or parmesan cheese. What cheese can I substitute? You can omit it or sub with a cheese you like. I used grated sharp provolone. So good! I’m wondering if you could skip the second tablespoon of oil. 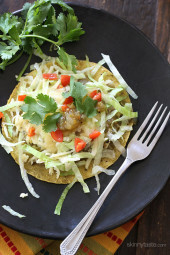 One of our favorite recipes! I make something similar, originally from the Penzeys catalog/website. It adds a little lemon flavor in there too, and it’s delicious. I’ve also used kale. Mmm! Oooh, I bet freshly zested lemon would be great! Hello! Do you think I could use frozen broccoli and cauliflower instead? 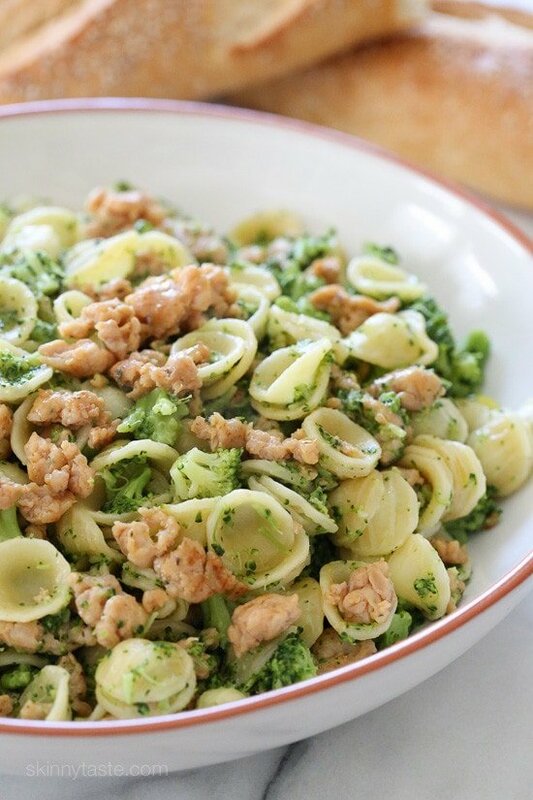 Do you think this could be made with broccoli rabe (blanched for 4 or 5 minutes and chopped fine)? I can’t get anyone in my house to eat broccoli, but they do okay with the more typically bitter type greens. Looks so good. I will be making this very soon. One question to Gina or anyone, can this be frozen in individual portions? Reheating tips??? Making for a new momma and want to be able to tell best way to reheat!! Thanks! I just nuke it in the microwave. My husband hates the micro and reheats it in a pan with some extra olive oil. I would like to know the same, can this be frozen? Very nice recipe and good suggestion to substitute broccoli for the broccoli rabe. Turned out perfect. I made this for dinner tonight. I use turkey Italian sweet sausage as that was all that was available. This is sooooo good. I’ll definitely be making it again. Made this tonight. So delish. Love the pesto vibe without the guilt. Also, my son loved it! Win-Win! Made this last night and it was amazing. I don’t like meat and I even like it, the girls aren’t great veggie eaters and they gobbled it up and hubby kept picking at the pot after he was done with his plate. So this is one of my new favorites! So easy and yummy!! This is a new favorite in our home. I added extra garlic and broccoli and was able to get a full serving of vegetables in one sitting. Very easy weeknight meal that is also great the next day. Gina, how do keep Orecchiette from nesting.? Whenever I cook it I wind up with stacked piles of pasta and the ones in the center are very al dente. Thanks. I bought all the ingredients for this today and we’ll have it Monday or Tuesday. Yum! Stir a few times before it comes back to a boil. Sooooo good! 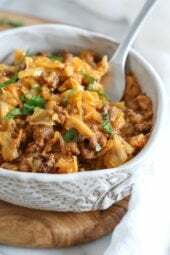 Hearty and tasty and easy to makes. I used turkey sausage instead of chicken otherwise followed the recipe. Thank you for sharing your delicious recipes.